Hi everyone!! I hope you all had an amazing holiday! 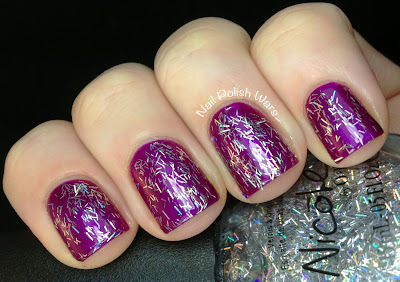 I'm so excited to show you the Selena Gomez Collection from Nicole by OPI!! Selena is a soft peach creme with a slight coral undertone and a very subtle shimmer. The formula went on a bit thin, but was easy to build up. Shown is three coats of Selena. 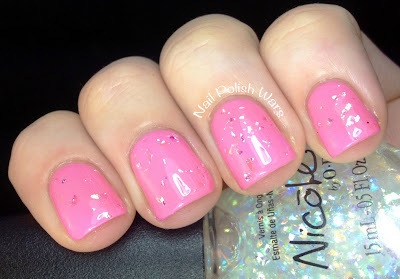 Naturally is a soft pink creme with a subtle shimmer. The formula was smooth and easy to apply, but was a little thin. 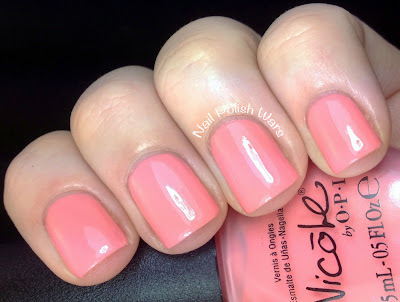 This one might possibly be a dupe of one of the most recent OPI Breast Cancer Awareness polishes, I Think in Pink. Shown is three coats of Naturally. Spring Break is a fun bright pink creme. The formula was very smooth and went on perfectly. 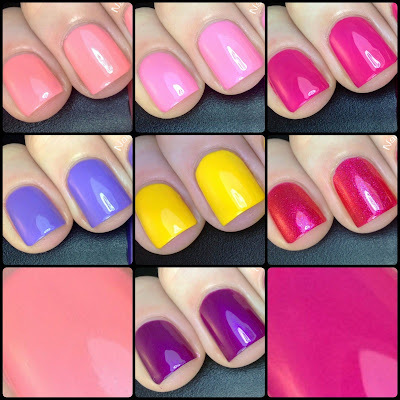 Shown is two coats of Spring Break. 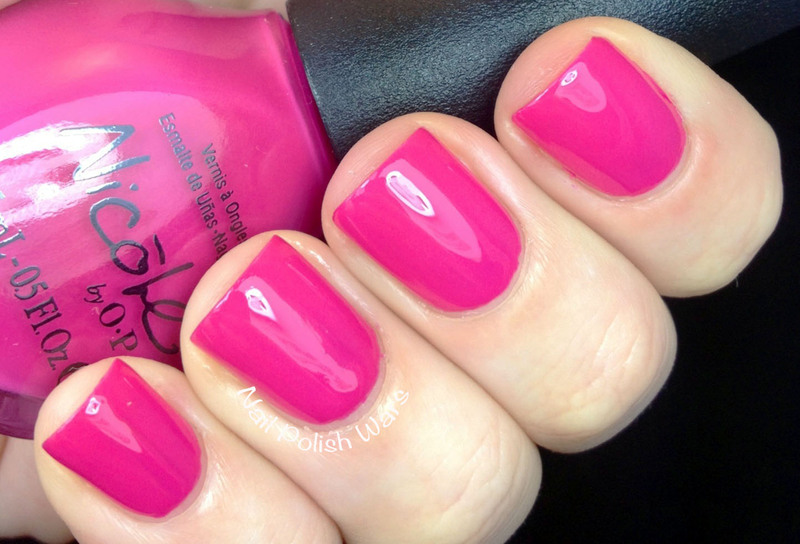 Love Song is a soft purple creme, with a periwinkle undertone. The formula was smooth and went on easily. I really like this shade a lot. It's fun but not overpowering. Shown is two coats of Love Song. 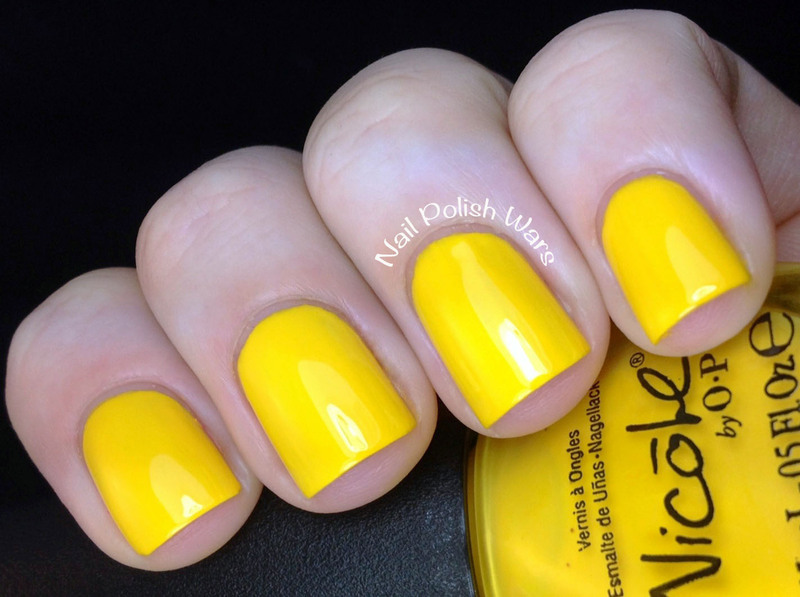 Hit the Lights is a bright yellow creme with a bit of a mustard undertone. As far as yellows go, this may be the best application I've seen. The formula was rich and easy to apply. 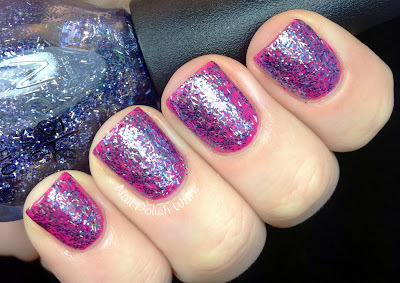 Shown is two coats of Hit the Lights. Scarlett is a bright red shimmer with a red violet undertone. 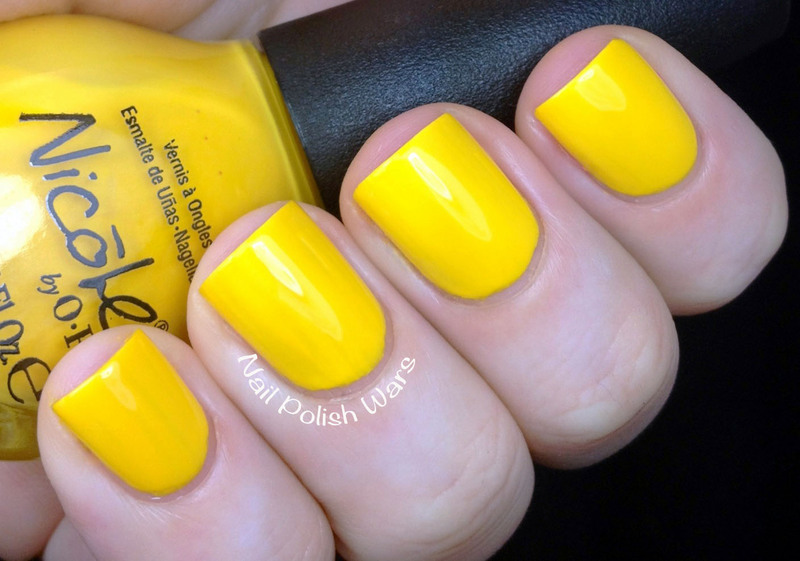 I have to say, I didn't like this one at all as soon as I saw the bottle, but I love it on the nail. The formula was very smooth and applied perfectly. This one might possibly be a dupe of OPI's I'm All Ears and You Only Live Twice. Shown is two coats of Scarlett. 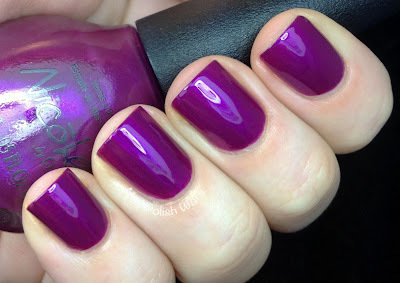 Pretty in Plum is a muted deep purple shimmer. The formula was smooth and easy to apply. 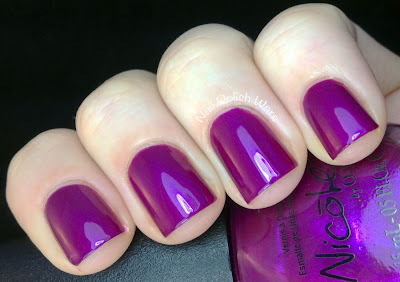 Shown is two coats of Pretty in Plum. 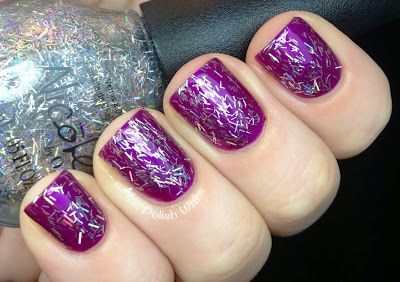 Sweet Dreams is a clear coat loaded with silver and teal hexes, and purple micro hexes. The glitter applied easily and evenly. Shown is one coat of Sweet Dreams over Selena. 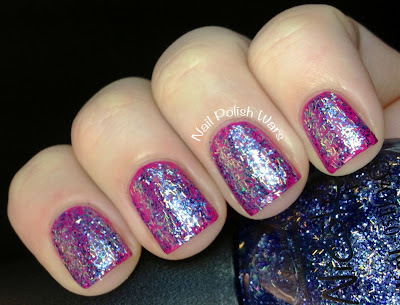 Heavenly Angel is a clear coat with iridescent flakes. This is not an easy one to apply. The formula is very thick, and there are not nearly enough flakes to compensate for that, making it very hard to get any kind of decent flakie coverage. Shown is two coats of Heavenly Angel over Naturally. 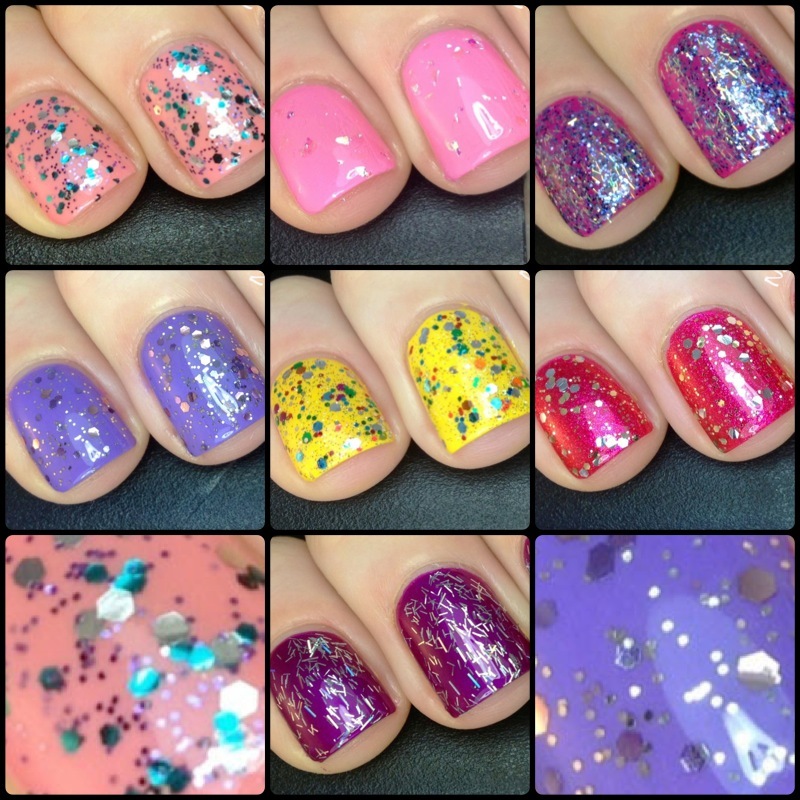 Mi Fantasía is a clear coat loaded with teal and silver fiber bar glitter and purple micro glitters. The glitter did not apply easily and seemed to want to stay group together rather than spread out. 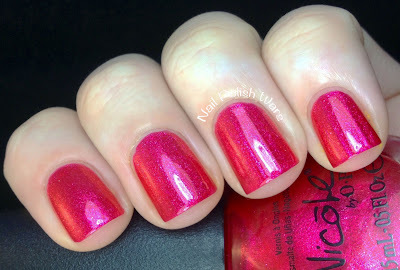 This one really reminds me of last year's Marry a Millionaire from China Glaze. Shown is one coat of Mi Fantasía over Spring Break. 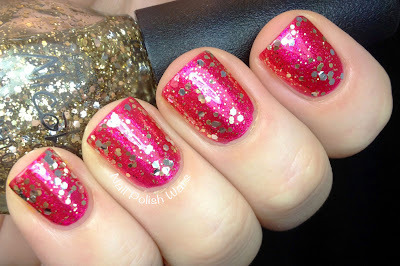 Inner Sparkle is a clear coat with soft rose pink hexes and gold micro hexes. 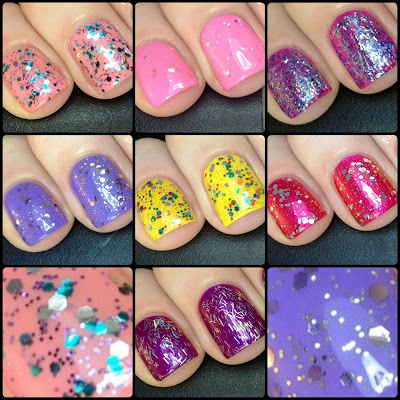 The glitte applied very easily and spread out nicely. I really love this one. It's so delicate. Shown is one coat over Love Song. 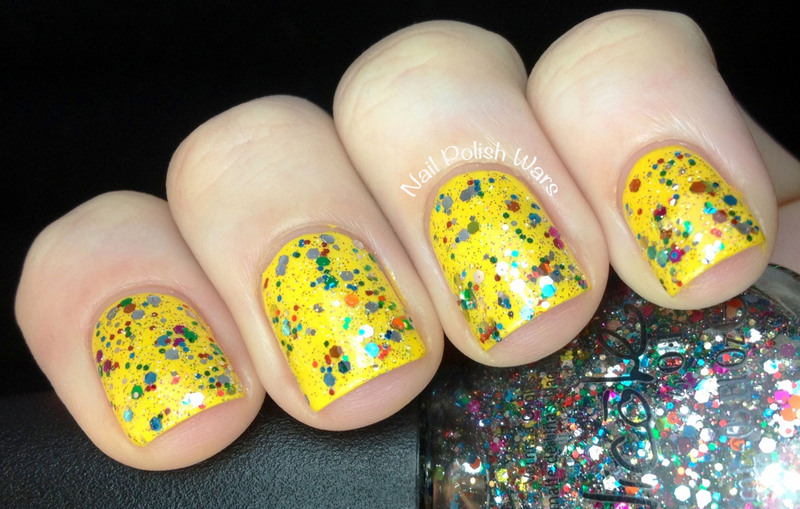 Confetti Fun is a clear coat loaded with multicolored hexes and silver micro glitter. The glitter applied easily. 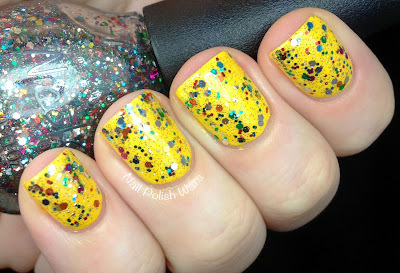 This might be a dupe of Confetti Tasmanian Devil. Shown is one coat over Hit the Lights. 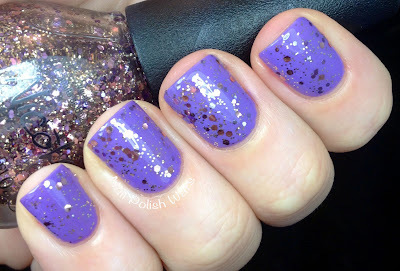 Kissed at Midnight is a clear coat with gold and silver hexes and gold micro glitter. The glitter applied very easily. I didn't think I would like this one too much, but I really love it!! Shown is one coat over Scarlett. Stars at Night is a clear coat with silver holographic bar glitters. The glitters went on easily and spread out nicely. This one is a dead on dupe of Zoya Electra. Shown is one coat of Stars at Night over Pretty in Plum. I like the majority of these, but there were a few that gave me some difficulties. Hit The Lights looks so pretty! I need it in my life for sure!